A replacement cartridge for CO2 inflators, the Planet Bike 12g Threaded CO2 Cartridge offers a medium level of inflation for any type of tire. A replacement cartridge for CO2 inflators, the Planet Bike 12g Threadless CO2 Cartridge offers a medium level of inflation for any type of tire. 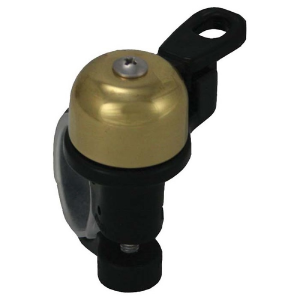 The Planet Bike 16g Threaded CO2 Cartridge supplies full inflation for any type of tire. The Planet Bike 16g Threadless CO2 Cartridge offers full inflation for any type of tire. Made from lightweight alloy, this Planet Bike water bottle cage features a durable design and nonmarking buttons for easy entry/exit of bottle. 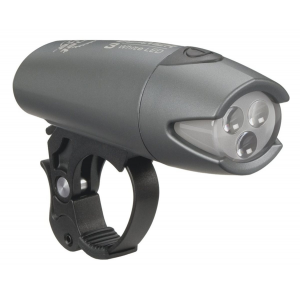 Stay visable with the Beamer 1 Front Bike Light and Blinky 3 Rear Bike Light. A handy item if you ever get that flat tire in the middle of nowhere. Featuring 140 lumens with amber side lights, the Blaze 140 SL headlight lights your way in the dark, and stays highly visible in daylight to alert cars and other cyclists to your presence. 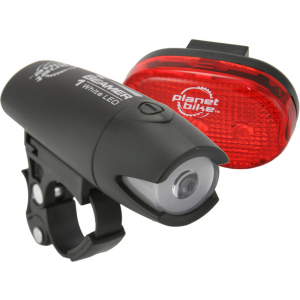 This powerful, durable, rechargeable light set from Planet Bike delivers front and rear lighting to improve your visibility to cars and other cyclists as you ride. A small bell to let people know you are behind them. 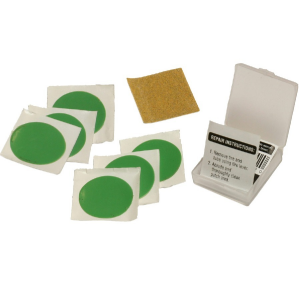 This multiple-use LED safety strap can be used as a leg or arm band, or as a collar for your dog. The Cascadia Hybrid/Touring bike fenders are the top-of-the-line edition from Planet Bike. The width fits most bikes with 700c wheels.